Having been out of work for some time now, the cabin fever was setting in pretty hard. Between having no income yet still spending gas to get to job interviews, there was no gas to just get away for pleasure, a break from the monotony and certainly no funds for entertainment. I needed to feel useful again, productive. 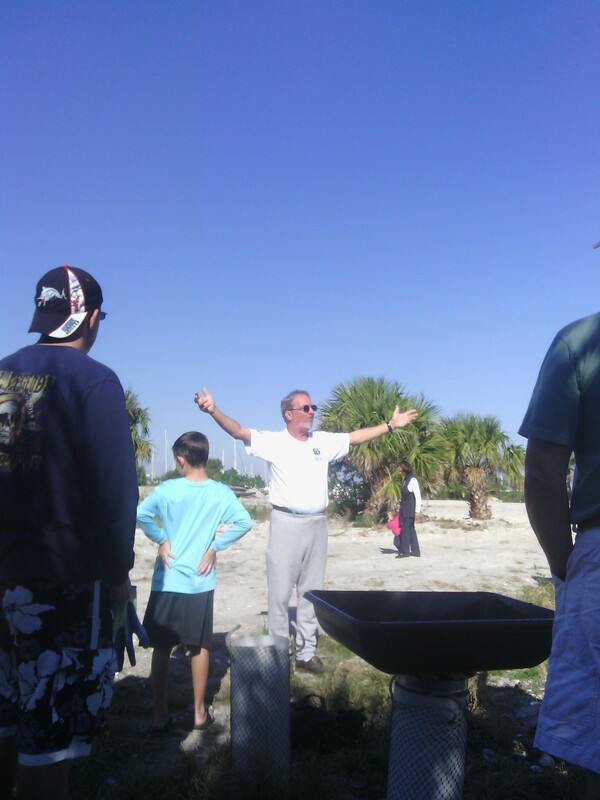 That is when I came across a request in the local paper for volunteers to help that coming weekend on a project to build an artificial reef in the area. I’m a nature lover and have always been interested in (and often active in) conservation efforts – how cool was that? After e-mailing the listed contact for details, I was excited to get to work – even if it was for free. I let a friend of mine know about the project and he was on board as well. 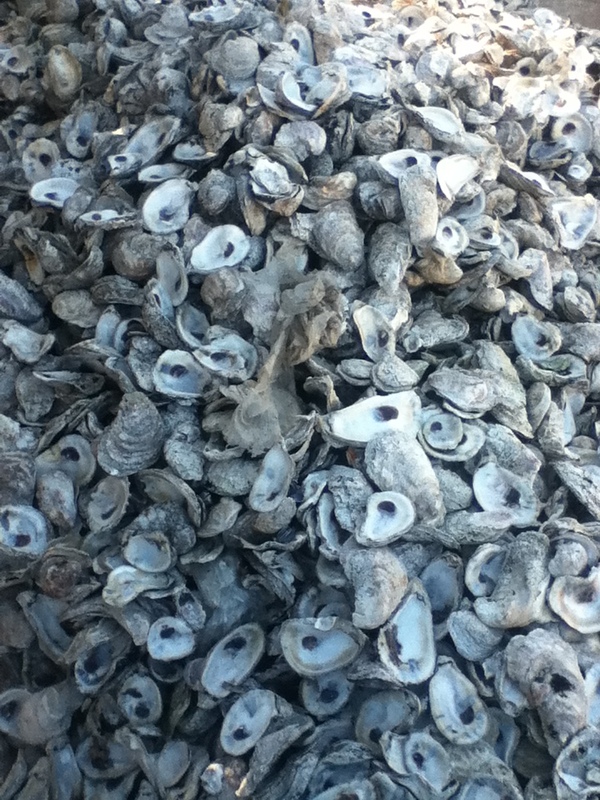 That Saturday, he picked me up early and we went out to Harbour Pointe on the inlet where several tons of oyster shells were ready in large barrels and on sheets of plywood in huge piles. About 20 other volunteers showed up and we were given a brief primer on the task at hand. We organized ourselves into each area – shoveling, bagging and tying off. 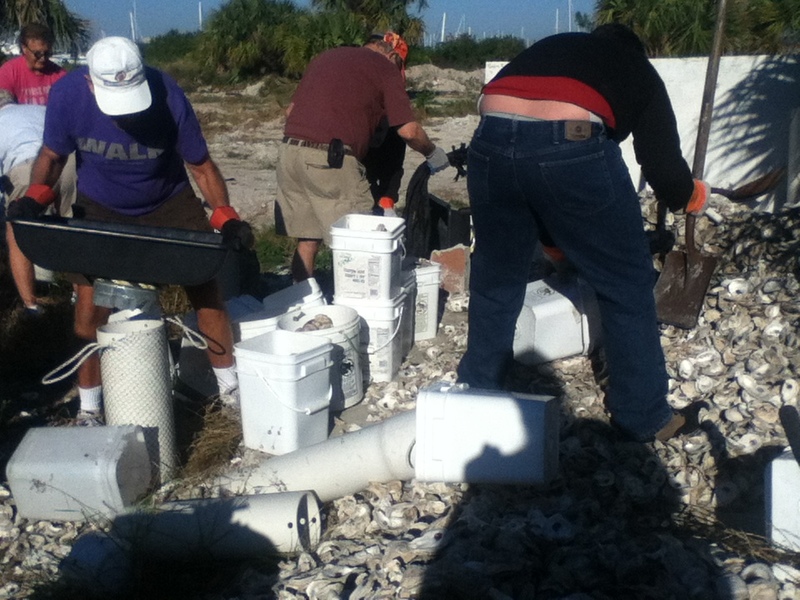 I shoveled shells into smaller buckets while my friend bagged and tied them. They were then loaded onto a truck to be moved to their final resting place in Wildcat Cove. During a break in which bottled water and other drinks were provided, the leader of the operation and a colleague commended us all on our efforts which far exceeded their expectations. 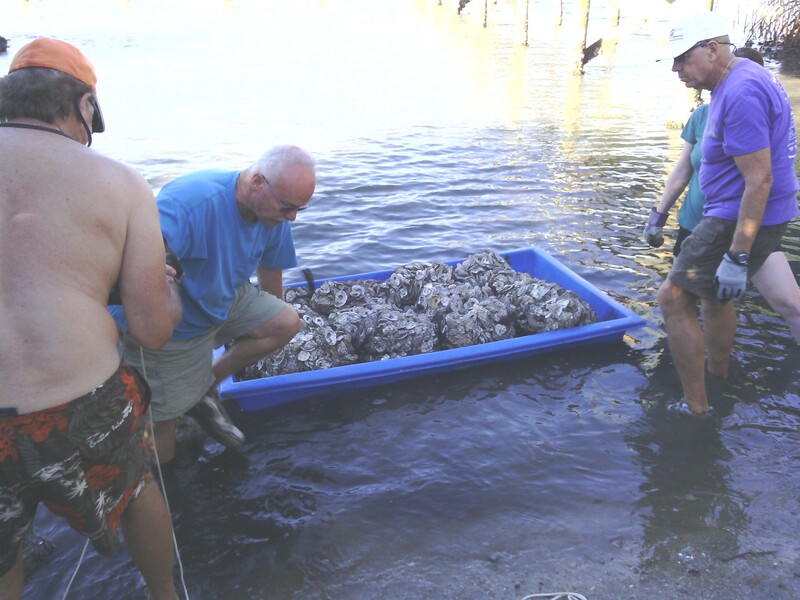 In just about 2 hours, we’d already assembled about 400 20-pound oyster bags for deployment. 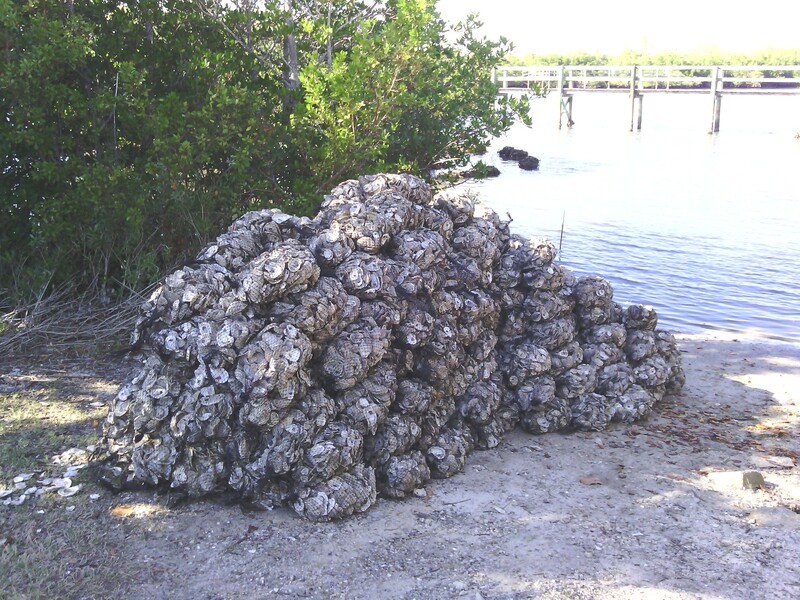 My friend and I stayed for a 20-minute informational lecture about oyster reefs, their local benefits, lots of statistics and zoological info as well. We broke for lunch then and would meet up at low tide a few miles up the coast at Wildcat Cove. 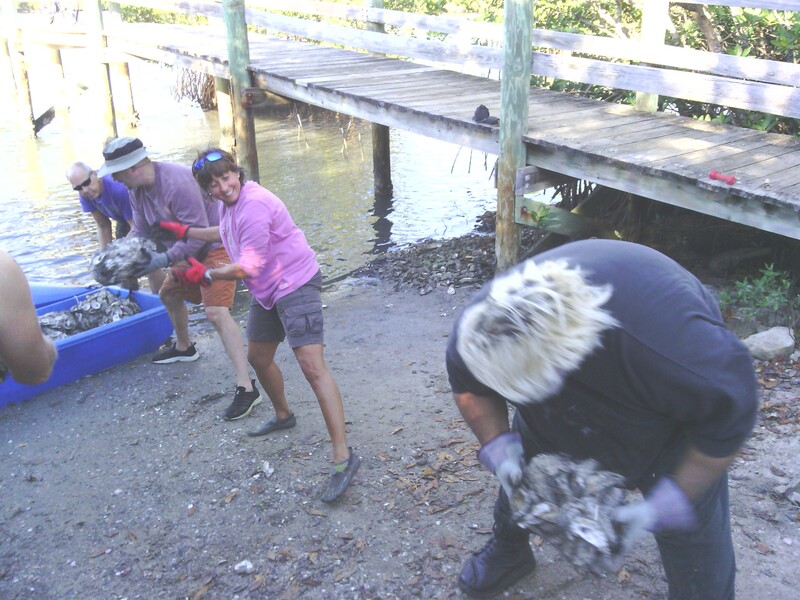 Upon arrival at Wildcat Cove, we found the oyster bags in a neat pile in front of the canoe launch. Another 100 bags had been assembled and brought up in two deliveries. 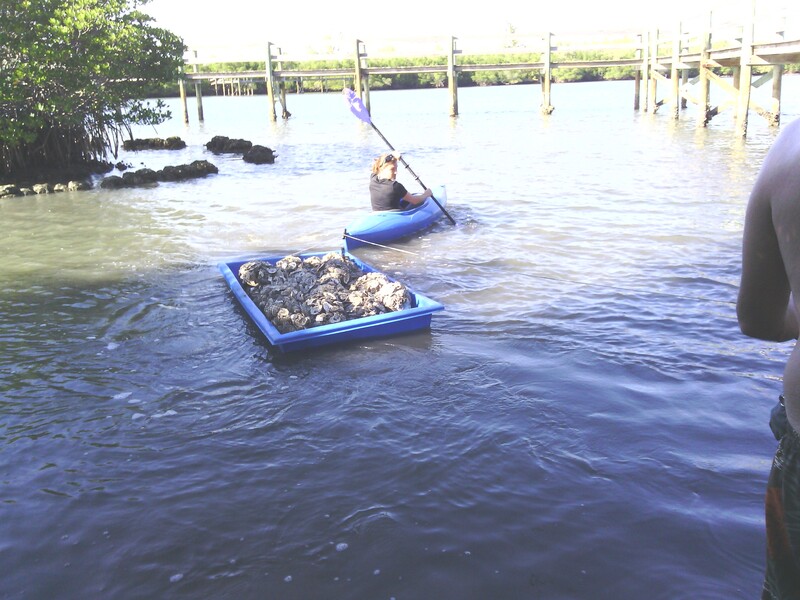 It took a little brainstorming as to how we were going to get the bags to the reef area, but one adventurous girl with her own kayak said she could pull floating tubs of about 30 bags per load out to the location. There was some interesting trial-and-error in getting the system going, including one thankfully good-humored man getting impossibly stuck in the thick muck at the bottom of the river. It took more than ten minutes to get the river to release his legs and he lost a shoe, but we got him back safely! Note to self: Don’t go into the water without a boat here! Once we got the production line going, the rest was – pardon the pun – smooth sailing. 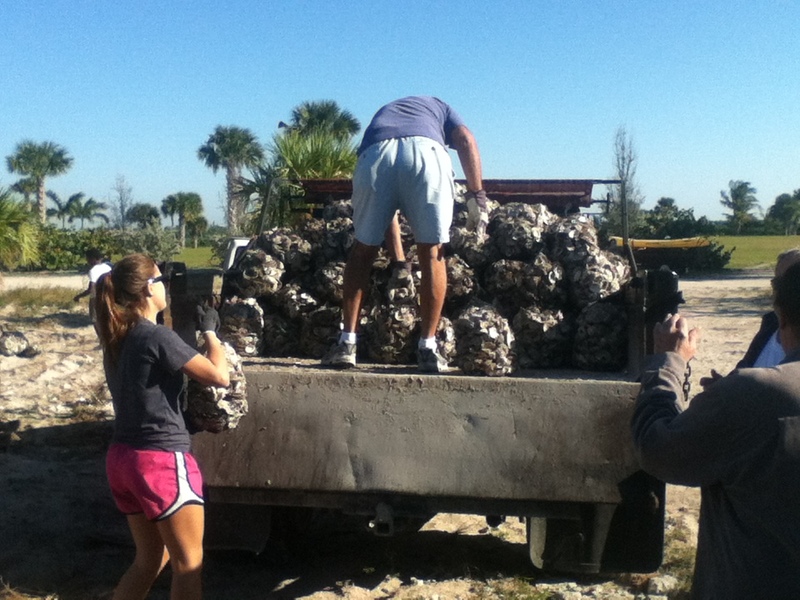 Bags were floated out to a mangrove area where a 4-foot high oyster “wall” was built staggered around the mangroves. 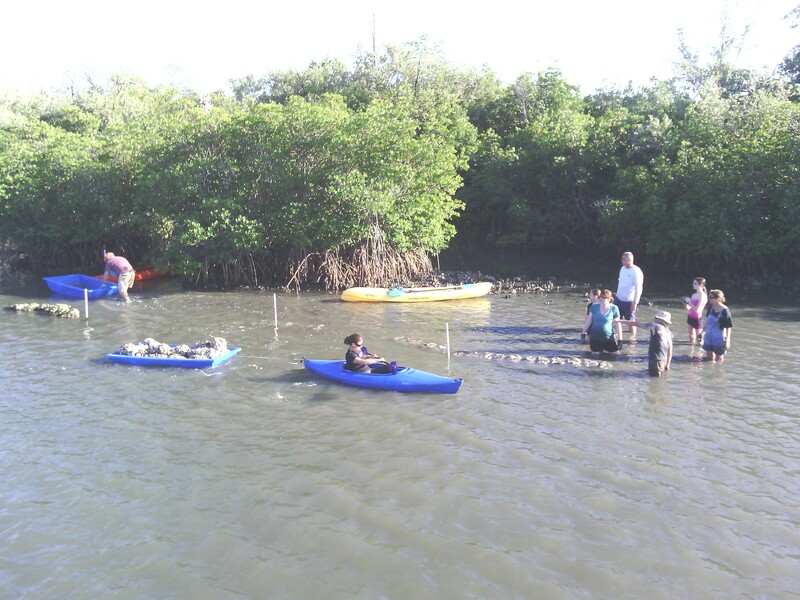 Once settled and cemented, these artificial reefs will provide settling places for new oyster spawns, as well as providing habitat for young fish and feeding grounds for birds such as herons, ibis, loons, cormorants, anhingas and more. I remain in contact with the organizer of this effort who works for the county in coastal restoration and he is helping me network with other people in the field so that I may actually find work in conservation or a related field. Even if it is a desk job, it would be a great opportunity (and has been) to do something productive in a field I really enjoy. Another reef build is coming up in two days. This time my daughter will also be involved, getting her hands dirty and having a positive impact on our local, unique and delicate ecosystem. Tornado watch remains in effect for Treasure Coast until 4 p.m. : Treasure Coast : TCPalm. See the above link for official stats. So far today, the highest reading for rainfall has been 7.8 inches in St. Lucie County, recorded around 11 a.m., according to National Weather Service. The average rainfall so far today is 6 inches. Winds have been recorded in the county at 40 mph. Sheriff Ken Mascara (St. Lucie County) is urging drivers to stay off the roads due to extensive flooding. At 10:40 a.m. – A tornado has touched down at the Shell gas station on U.S. 1 near Monroe Street just south of Stuart. A vehicle flipped over and power lines are down. FPL workers are en route. Southbound U.S. 1 traffic is reduced to a single lane. Locally on the southern end of Fort Pierce’s industrial area and approximately 2 miles from the coast (neighborhood area of Edwards Road, Oleander Ave., Midway Road and 7th Street), max sustained winds have peaked at 24mph with the highest gust being at 38mph. There is an indoor draft as winds shift and gust. At 11:00 – Rain is currently very heavy and blowing in from the East as it has been all morning. Very few southern shifts have been experienced, and then only briefly. This area has received 4.96″ of rain between midnight and 11:00 a.m. and it is still coming hard. At 11:20 a.m., the wind has shifted from the SE at 26mph with the approach of another strong cell. Air temperature has not risen above 73.3F. No hail has been experienced, however the combination of high wind gusts and heavy rain has caused sparking and sizzling of powerlines on this street. The transformer in the rear of this location has been humming and buzzing with strong power surges. This could be due to the power lines running through the middle of large, untrimmed trees in the adjoining yards. At 1:00 – Power lines along 7th Street continue to buzz steadily and loudly for several hours now and I expect to lose power soon. Reported to FPL who needs to assess these lines quickly, something is not right. Damage in this immediate area has thankfully been minimal, involving downed mail boxes, blown trash cans and slight moisture seeping in windows. It is also likely during high wind gusts for rain to blow into attic vents (under eaves and under roof peaks on the sides of houses) and dampen the sheet rock of the ceiling. At 1:00 p.m., the center of Tropical Storm Fay was over Caloosahatchee and tracking NNE toward the Treasure Coast at 8 mph, with sustained winds of 65 mph. Rains should start to subside slightly as the winds begin to increase over the next few hours. Late Tuesday Update: Center of TS Fay appears to be over the city of Kissimmee right now, and I am praying for the winds to finally shift West so that my front window, which already had a gaping foot-wide hole in it from where someone threw a rock through it, can have some relief. It is only patched with duct tape inside and out, and the tape has failed with the driving rain, letting water inside. Additional tape applied to the inside is also seeping through. There were no tools available to actually board up the place before the storm as I am still in the process of moving and much of my stuff is still at the old location. I am alone here, and scared to say the least. 2:45 p.m. Wind ESE 18 / Rain Unchanged / In 45-60 mins, center will be 40 mi. west of Fort Pierce. * At 1219 PM EDT… National Weather Service Doppler Radar Indicated Very Heavy Rain Continuing On The East Side Of Tropical Storm Fay. Multiple Rainbands Are Producing Torrential Downpours… Which Has Caused Extensive Runoff And Closing Of Roadways. Doppler Radar Estimates That 4 To 6 Inches Of Rain Has Occurred In Martin And St Lucie Counties With Some Isolated Higher Amounts. Additional Rainfall Amounts Of 2 To 4 Inches Will Occur In The Warned Area. Flooding Is Occurring Or Is Imminent. Most Flood Related Deaths Occur In Automobiles. Do Not Attempt To Cross Water Covered Bridges… Dips… Or Low Water Crossings. Never Try To Cross A Flowing Stream… Even A Small One… On Foot.